I was on facebook (grudgingly--it is rather a silly venue to me) the other day just to get caught up on messages. One of my friends sent me one of those tests that you take to reveal yourself. It was an interview......it was an eternal interview which wouldn't end which seems to me to be metaphoric of facebook. I know, all of us immediately would say, "Neither, thank you." Stupid question we all agree (as were most of the facebook interview questions). But, that wasn't an option....there was no "c." So I sat there in that "Groundhog Day" (another one of my favorite movies ever) moment in that eternal facebook interview and really had to think. I love two things in the world more than anything really. I love reading and I love music. Most of my life has been integrally wrapped up with these two passions, in one way or another. I really couldn't decide........the visceral experience of reading and the meditative qualities it has are so singular and special to me that I couldn't imagine not being able to experience that ever again. But every time I listen to music I become spiritual almost (it's probably the only time that I am ever spiritual). Music does that to me. So, I've really been thinking about that question since then.....what if I really had to lose one of my two most favorite things (the third would be food and the fourth would be vodka)? I finally came to a decision. I would regret losing sound more. While I wouldn't wish it, I could imagine living without ever seeing blue sky again. But the thought of never hearing another song seems too unbearable, too utterly desolate and lonely. Growing up, I loved singing and I sang in choirs for most of my school years. I developed a love for choral music as a result which has lasted my lifetime. There is nothing more amazingly vibrant and spiritual than standing in the middle of a bunch of other choristers singing a beautiful song. Something happens and your voice blends with the other voices and it becomes this living breathing thing. There is this remarkable vibration (I'm not talking new age here) or wave that happens. It doesn't happen often. It usually happens after intense rehearsals, after voices learn to blend with each other, but when it does there is nothing better in the world to experience, period. I mean NOTHING better. So one of my many musical interests and passions is choral music. Over the years we've collected recordings and attended concerts periodically. Last Christmas Eve we were listening to a concert on NPR (I adore NPR) by a choir called, CONSPIRARE, and I literally started crying it was just so magnificent and beautiful. All these years arguably one the very best choral group in the world has been singing away and I've just learned about them! CONSPIRARE is, I believe, a musical term which means "to breathe" or something like that. 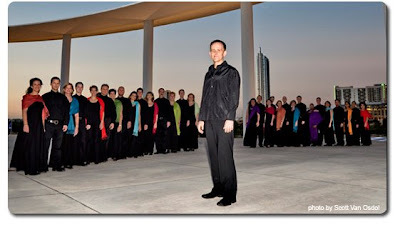 The group is a professional choral group based out of Austin and is led by the most appealing, engaging dude, Craig Hella Johnson. His beauty is not just external. It is his intelligence and passion for his music that makes him even more appealing. CONSPIRARE is really one of the preeminent professional vocal groups in the world. What I find so impressive and attractive about the group is that they incorporate all sorts of music into their repertoire. They also do rock songs, cover songs, jazz, spiritual stuff of non-traditional choral music that I think is unique and wonderful. I have yet to see them live in concert. But I love listening to their music. When I first started this blog I couldn't find any video footage on CONSPIRARE to post on them. But I finally found some great clips that I think will illustrate just how amazingly beautiful their music is and how very special choral music can be. 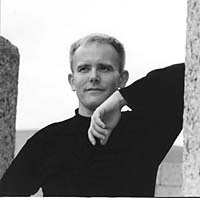 The first clip is a short (2min) interview with conductor Craig Johnson which a good introduction to the group. Craig Hella Johnson on Conspirare from KLRU / Conspirare on Vimeo. The second video, is a short (10min) clip from a recent concert which offers 3-4 songs and shows their range of material--one of the songs is Carly Simon's gorgeous "Let the River Run". It also demonstrates, I think, for someone who has either never sung in a choir or never listened much to choral music, that "thing" that happens as a singer in a choir. If you listen closely sometimes you can hear the collective vibration of the voices which becomes sort of a single "wave". Goosebump city. A Company of Voices: Conspirare in Concert from KLRU / Conspirare on Vimeo. I think this demonstrates why my answer would be: "b. sound." What would yours be, and why? Leave a comment below.